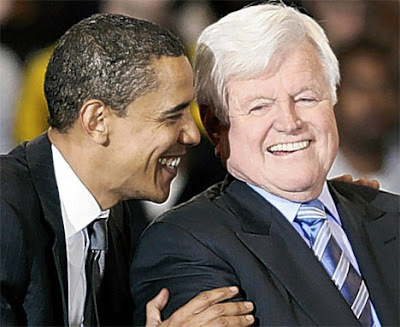 I was hoping that the climax of the health care reform effort would involve an ill Ted Kennedy staggering onto the Senate floor, casting the deciding vote to break a filibuster. Now he's dead, and I'm not sure where this leaves the living. When will he be replaced? What will the Massachusetts legislature do? Will there be a gubernatorial appointment, and if so, who'll be picked? If he's replaced by special election, who will win the Democratic primary to fill his seat? The best person for the job is probably Barney Frank, but he's got plenty of useful stuff to do in his current job, and I doubt he would even want to leave his House seniority and the chair of the Financial Services Committee for a Senate gig. Update: An emailer notes that "one of the things one wants is for Ted Kennedy to be replaced by someone who's not only liberal and effective, but also very young, so that he can grow up to be a powerful committee chair and all-around respected figure. Someone like Jarrett Barrios. The problem is that it's hard to point that out as an asset in a primary campaign when there are lots of experienced, well-qualifed Bay State politicians who've been waiting decades for a senate seat to open up." Jarrett Barrios has been the president of Massachusetts Blue Cross / Blue Shield for the past couple of years. That... doesn't seem to make him an obvious right choice for the Senate in a period where one of Congress's main goals is reducing the power of health insurance companies.